In this assignment you will extend our simple resume database to support Create, Read, Update, and Delete operations (CRUD) into a Position table that has a many-to-one relationship to our Profile table. This assignment will use JQuery to dynamically add and delete positions in the add and edit user interface. You might want to refer back to the resources for the previous assignment. The documentation for PDO lastInsertId() where you can retrieve the most recently assigned primary key as a result of an INSERT statement. This assignment will add one more table to the database from the previous assignment. 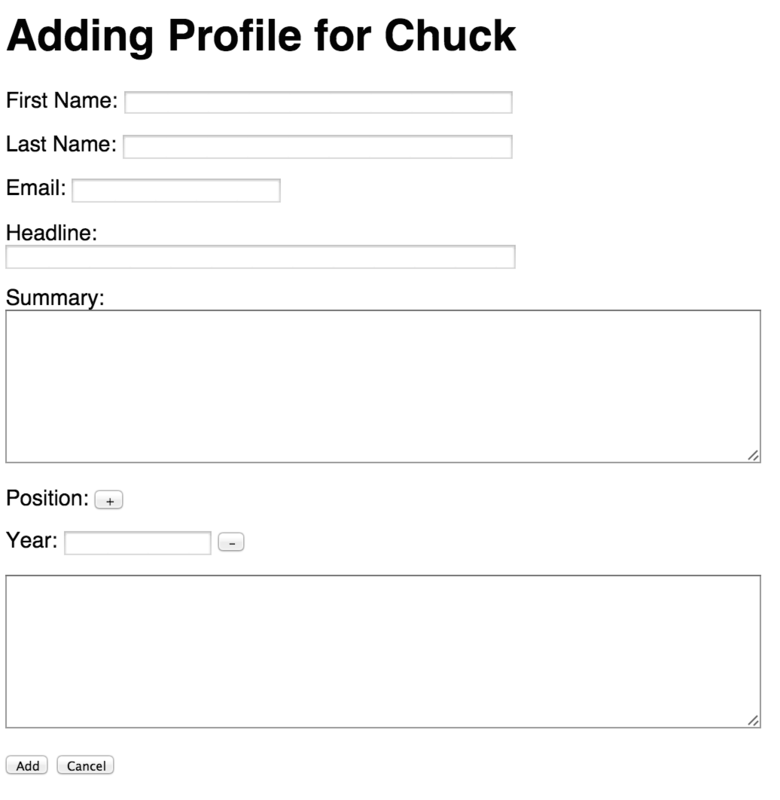 We will create a Position table and connect it to the Profile table with a many-to-one relationship. There is no logical key for this table. The rank column should be used to record the order in which the positions are to be displayed. Do not use the year as the sort key when viewing the data. We will be extending the user interface of the previous assignment to implement this assignment. All of the requirements from the previous assignment still hold. In this section we will talk about the additional UI requirements. add.php You will need to have a section where the user can press a "+" button to add up to nine empty position entries. Each position entry includes a year (integer) and a description. view.php Will show all of the positions in an un-numbered list. edit.php Will support the addition of new position entries, the deletion of any or all of the existing entries, and the modification of any of the existing entries. After the "Save" is done, the data in the database should match whatever positions were on the screen and in the same order as the positions on the screen. If the user goes to an add, edit, or delete script without being logged in, die with a message of "ACCESS DENIED". You might notice that there are several common operations across these files. You might want to build a set of utility functions to avoid copying and pasting the same code over and over across several files. In addition to all of the validation requirements from the previous assignment, you must make sure that for all the positions both the year and description are non-blank and that the year is numeric. The logic is somewhat simple and gets confusing when there is a combination of adds and deletes. It will never add more than nine new or total positions, but if you delete some of the positions, you do not get a postion "back" to re-add unless you press "Save". So if you add eight positions and then delete five positions without pressing "Save", you can only add one more entry rather than four more entries. Note that we handle gaps by simply checking the data that is present and skipping any data that is missing. When you are building the add.php code to add a new profile and some number of positions, you need to insert the profile_id as a foreign key for each of the position rows. But since you have not yet added the profile you do now know the profile_id which will be selected by the database. The variable $profile_id contains the primary key of the newly created profile so you can include it in the INSERT into the Position table. When you implement edit.php the user can do any combination of adds, removals, or edits of the position data. So when you are processing the incoming POST data, you need to somehow get the data in the database to match the incoming POST data. One (difficult) approach is to retrieve the "old" positions from the database, and loop through all old positions and figure out which need to be deleted, updated, or inserted. If you want to try to do that for this assignment - feel free - but consider it an "extra challenge". This approach has the nice advantage that you are reusing code between edit.php and add.php. The only difference is that in edit.php you just remove the existing entries first. Try to so the more inticate approach to updating positions in edit.php without using the "delete all the previous positions" trick. It will help if you add the position_id form markup that you generate for the positions that came from the database when edit.php starts. You must use the PHP PDO database layer for this assignment. If you use the "mysql_" library routines or "mysqli" routines to access the database, you will receive a zero on this assignment. Your name must be in the title tag of the HTML for all of the pages for this assignment. All data that comes from the users must be properly escaped using the htmlentities() function in PHP. You do not need to escape text that is generated by your program. You must follow the POST-Redirect-GET pattern for all POST requests. This means when your program receives and processes a POST request, it must not generate any HTML as the HTTP response to that request. It must use the "header('Location: ...');" function and either "return" or "exit();" to send the location header and redirect the browser to the same or a different page. All error messages must be "flash-style" messages where the message is passed from a POST to a GET using the SESSION. Please do not use HTML5 in-browser data validation (i.e. type="number") for the fields in this assignment as we want to make sure you can properly do server side data validation. And in general, even when you do client-side data validation, you should still validate data on the server in case the user is using a non-HTML5 browser.